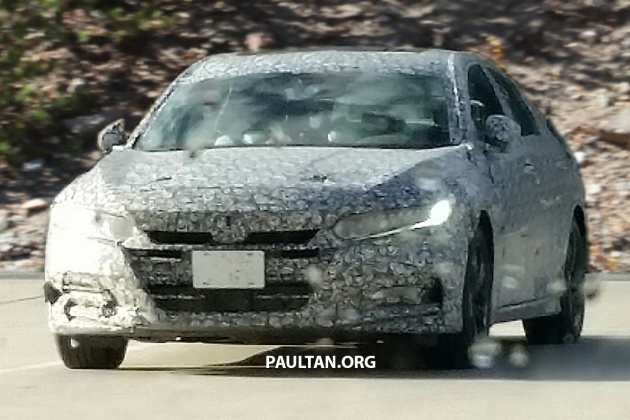 It has been confirmed that the 2018 Honda Accord will make its debut this year. The next-generation sedan will first surface in the US, which is its biggest market. This was announced by Honda president and CEO Takahiro Hachigo at the Honda Meeting 2017 event in Japan. According to Hachigo, the full model change Accord will boast “a further advanced design and driving experience.” The company chief also said that “we are going to launch our new design direction at an auto show this fall,” which means that the upcoming Accord will most probably lead the way with the new family look. We’ve seen some spyshots, but none that are very revealing. Today’s Accord is a handsome saloon, and while the Civic FC has captured the imagination of many with its bold design, the Accord has to be more conservative – you don’t want to alienate the more mature crowd. On that note, we wonder how the US-market Camry and its shocking face is doing. What else can we expect from the 2018 Honda Accord? A turbo engine, of course. The latest Civic and CR-V have moved to Honda’s 1.5 litre turbocharged engine – pushing out 173 and 193 PS respectively, in our market – and a variation of this engine should find its way into the new Accord. Like those models, the 1.5T would be paired to a CVT automatic, which will retire the torque converter auto in today’s car. The next Accord could still be offered with a naturally-aspirated four-pot as the base variant, as per the Civic and CR-V. There will be an Accord Hybrid too, but North America will need a V6 or equivalent engine as the range-topping non-hybrid variant. Will Honda continue to offer an NA V6, or will there be a high-powered turbo-four in its place? Honda already has a 10-speed automatic on sale in the US (in the Odyssey), and this torque converter unit could feature in the Accord. Another question is if Honda will continue to provide a six-speed manual for base models? A manual Accord is alien to us in Asia, but there’s such a creature in the US. Request to web developer, can make the ‘laughing’ button like what FB had? I felt I wanted to click by it’s not there… just suggestion. That is true as far as Camry sales, but that includes fleet sales. If you research sales to retail customers, the last generation Accord passed the Camry for retail sales and the Accord also passed the Prius for sales in California. The Civic also outsold the Camry and Accord for retail sales in 2016. As toretto said in the movie – doesn’t matter if you win by an inch or a mile, winning is winning. Why the Camry is popular with fleet sales? Features, reliable, warranty, network support and service quality. Mr.Akio Toyoda ,when launching the 2018 Camry in USA,was so proud to say that the camry has been USA’s best selling mid size sedan 15 years in a row. But not here in Bolehland.Due to poor marketing strategies of UMW,the Accord has overtaken the camry,in terms of sales for some time. Toyota jAPAN ,Mr.Akio….we humbly request your excellency to personally come here to launch TOYOTA MALAYSIA with another bumi partner,to restore Toyota to its rightful position in terms of non national TOP CAR SALES. Eh dun so ‘chuin’ here. According to basher, u repot to our PM. We own u, so we can tellings what u to do. 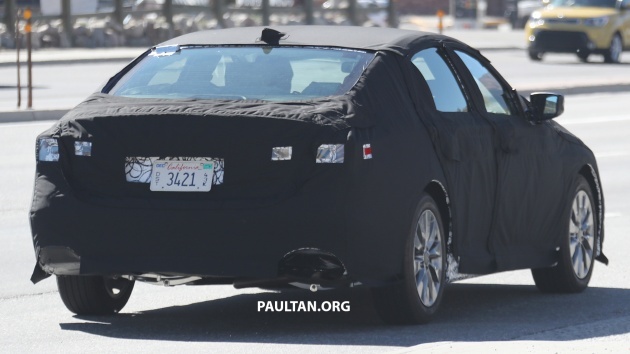 Hmmm we seen this b4….Oh yea, the Perdana3. In US, Honda Accord is US$22k. Fresh graduate earn US$4500 minimum. In Malaysia, Honda Accord is RM150k. According to EPF statistics, 78.3 of all EPF contributors earn RM1500 and below. How to afford Accord like that? Where is our 30% price reduction promise? When price high, u says too exp. When reduced prices, u pulak hentam no RV. So mana mau ni? Which world u came from that has bog standard cars with super low price & super high RV? john oh john, still copypaste the same thing. You keep on saying your gomen has reduced X5 from RM588k to RM388k and we must be grateful. But pls pakai hotak. How many people can afford RM388k? If gomen reduce also it must be for Saga, Axia, Myvi and Persona. Majority people can only afford RM60k and below. Saga mivi axia r reasonably affordable. Even fresh grads go straight for vios/ city/ fiesta! reasonably affordable?? ?r u seriously dumb or stupid? ?too many roti john in ur brain? ?for them $22k can get accord..for us $50k can get saga?Yes it is because of the forex exchange..bt hey rm80k for accord can u imagine the actual price fr saga??20k? ?if u can eat roti john only dont talk rubbish..go eat buntut ayam coz too cheap n can save money to buy accord..
Because the luxury cars has duty excises tax that the reason prices are going super expensive and no RV. Current malaysian & japan cars are don’t have excise duty. All cars have minimum 75% custom excise duty doesn’t matter if its CKD or CBU. Next Accord is using Civic platform. Stop talking rubbish…u making ppl stop buying cars…no go away from the net and study for yr SPM..go. Good car …this is going to make me rich…next year upgrade to E class ..pls support. Previous Post: AD: Enjoy free peace of mind warranty, complimentary road tax & insurance, and more from Medan Quantum!